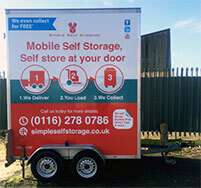 ﻿ Mobile Self Store Storage service of Simple Self Storage in Leicester. 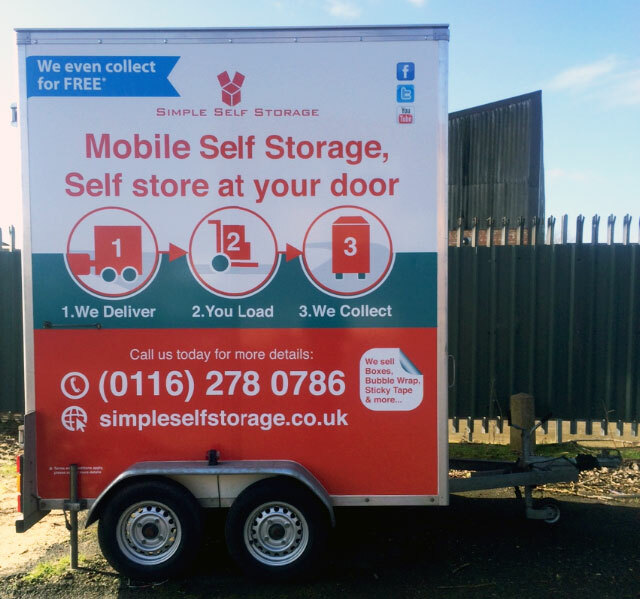 Simple Self Storage is now offering a very simple solution to storage including collection & delivery. We deliver a storage unit to your door in one of our custom purpose built trailers. You fill up the storage unit, lock it with your padlock and call our office on completion. We will then send out the driver to collect the storage unit and store it in our fully alarmed warehouse. Van Hire - Our service beats hiring a van and all the inconveniences that come with it. Hiring a van means you have to produce licence documents, pay the expensive hire premiums, on top of that pay an extremely high deposit, you have to get insured and you have to top up the diesel. Also you have the worry of getting a scratch on the van as the hefty deposit you paid will be lost. Who wouldn’t use the mobile self storage??? It would be expensive and inconvenient not to. We can also deliver to wherever you like In the same simple 3 step process. WHO USES US MOBILE SELF STORAGE? We sell furniture blankets which you wrap your furniture with to prevent scratches and scuffs whilst in transit. Just let us know 24 hours in advance and we will have your storage unit ready for you. We will have your storage unit ready for you when you arrive and park the storage unit directly in front of your car to help your loading/un-loading become as easy as possible.